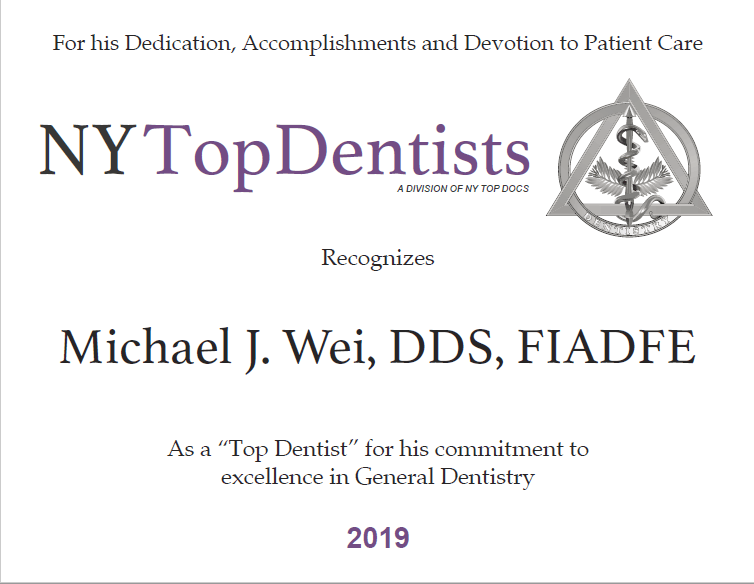 For the 14th consecutive year, Midtown Manhattan cosmetic dentist Dr. Michael J. Wei has been named America’s Top Dentist. 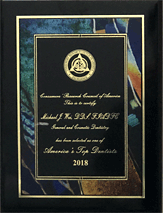 This award is given to dentists who provide consistent, exceptional dentistry services and superlative treatment to their patients. Awarded by the Consumers’ Research Council of America, this honor supports what Dr. Wei’s patients already know: He is an exceptional New York City dentist who works toward the goal of providing every patient with a smile that looks amazing and functions flawlessly. For over two decades, Dr. Wei has built a reputation as a respected and reliable cosmetic dentist, restorative dentist, and general dentist. He is dedicated to producing the finest smile makeovers customized to each patient. His clinical expertise and determination to produce perfect smiles have made Dr. Wei a sought-after Manhattan dentist. Dr. Wei’s New York City dental office provides comprehensive dental care. He uses innovative dental techniques, works closely with his dental lab to ensure that every dental solution is created as he designed it, and executes flawless restorations and cosmetic upgrades. All of Dr. Wei’s work is bolstered by his experience and the knowledge he has gained through regular continuing education courses and seminars. He is conscious of his responsibility to stay abreast of new developments in dentistry so that he can offer more smile makeover options to his patients. Flexible and multiple options are necessary for dental patients, so they can choose the dental treatments that suit their budget, oral health, and goals properly. Plenty of people live, work, and play in Midtown Manhattan. Dr. Wei makes it his job to deliver dentistry that blends with his patients’ schedules while never slacking on quality. Every smile that Dr. Wei touches receives impeccable treatment – Dr. Wei will not have it any other way. Porcelain veneers: Sometimes referred to as the “celebrity smile makeover,” porcelain veneers are an amazing way to correct multiple dental problems at once and walk away with a gorgeous, natural-looking smile. Porcelain crowns: Crowns are a versatile cosmetic and restorative dental treatment. They are used not only to beautify teeth, but to make them stronger and to serve as anchors for dental bridges. Dental implants: The innovative dental implants have changed lives forever. Often, implants are the preferred choice to dentures because they are permanent, comfortable, look natural, and allow you to eat, speak, and smile with confidence. Sedation dentistry: Not every dentist offers sedation dentistry. This benefit makes dental procedures easier for patients who are very anxious about their dental care. Oral conscious sedation allows you to “sleep” through your dental work so you wake with a beautiful new smile. Make your appointment with America’s Top Dentist in Midtown Manhattan. Even if you don’t need a major overhaul to your smile, your oral health is important, and keeping your teeth and gums in good condition means your smile will stay in excellent shape for years to come too. Dr. Wei is here to support your smile goals, whatever they may be. Contact our office to schedule your consultation.